It's an organic style of life in the park of Cinquantenaire on Sunday. 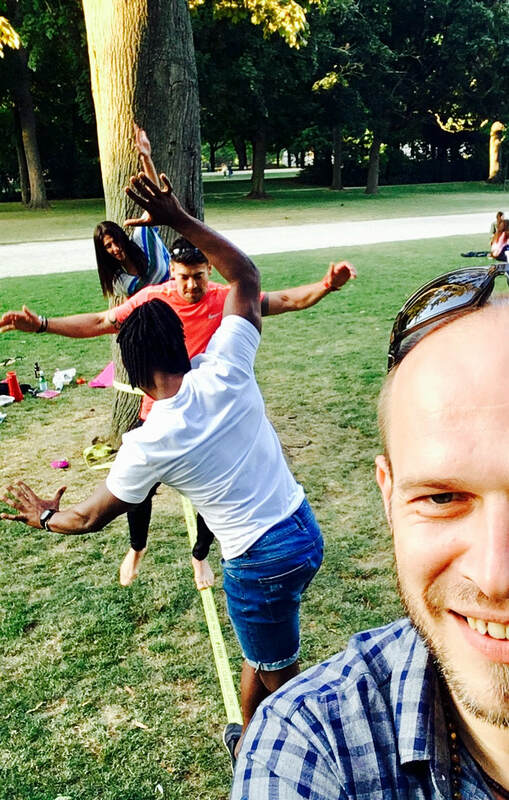 Nice worm up and complete workout for your body with Yoga following with a picnic and then the fun part - Slackline. Slacklining is a sport and art that can be a balance training, recreation, and a moving meditation. It is similar, at first glance to tightrope walking, and is accomplished by stretching and tensioning a 1”– 2” wide length of nylon/polyester webbing between two anchor points, most often trees. Yoga incorporating flowing movements and steady postures from a combination of traditions. There are elements of Ashtanga Vinyasa, focus on the strong detoxifying breath, easy Flow, steady Hatha and the drop of meditative Satyananda yoga - ending with Yoga Nidra - guiding you into a state of conscious deep relaxation. Here you'll have a time to work on your core strength while preparing your body for the balancing poses. If you are beginner - you'll have just listen to your body and do what your body allows and resting as often and as long as you need. Enjoy the benefits of yoga postures, breathing techniques and relaxation in a comfortable and non-competitive atmosphere. Hands on yoga adjustments to guide you into the correct yoga posture alignment. This is what makes these classes achievable for all ages and fitness levels. If you have any injury please let me know before the practice. Recharge your batteries and enjoy taking control of your physical, emotional and mental wellbeing as you move towards a healthier new you! This is a special invitation to come to the park and experience what yoga and balancing on the Slackline at the park can do for you! Dress comfortably, bring your own yoga mat or a beach towel, picnic and drinks (handmade with loads of Love are welcome), open mind, a smile and bottle of water. You can come and practice only Yoga, and maybe you can stay for a picnic - a nice come together for open minded people on the Sunday lunch/picnic. 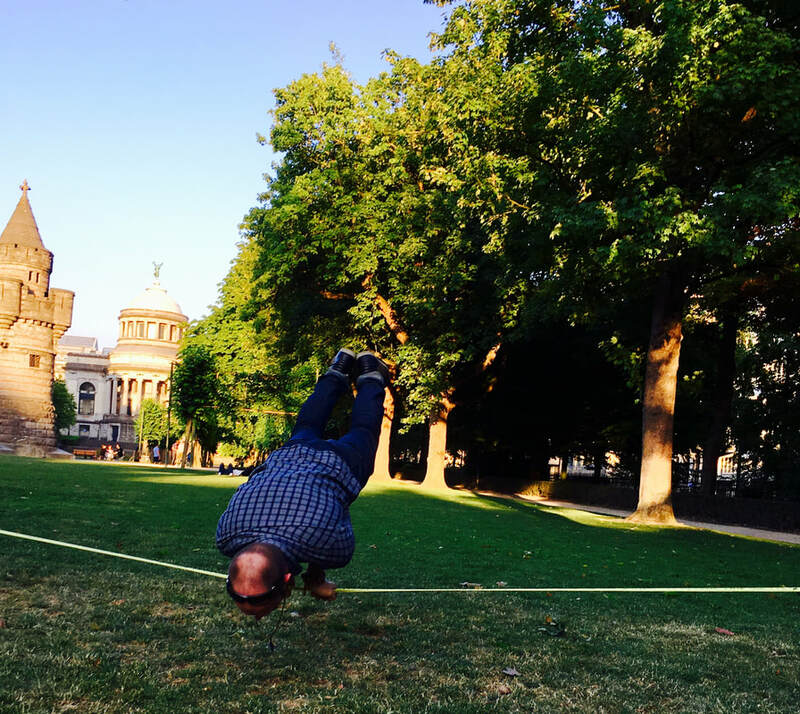 And after you have a fun part - Slackline, guided by Patman. The price is donation based. Sunday morning starting with Pranayama at 09:45 and with Asana from 10:00 till 11:15 then Yoga Nidra - deep guided conscious relaxation till 11:30'ish... Picnic till 12:30 and Slackline. Please let me know if you are interested to live this new experience. Let's Yoga team having Fun!